Many industries use 55-gallon drums to store and move chemicals, oils and other products. Storing materials close to their point of use is convenient for operations. In the cases of certain machinery and equipment, this means storing some drums outdoors, even if most of the drums remain in a central warehouse. Industrial sites use large numbers of pumps, motors, compressors and other equipment. Each of these use lubricating oil to keep them running smoothly. The lubricating oil is stored in drums. Operations and maintenance staff routinely check the quality of oil and replace it as needed. Some plants use chemical and food additives to manufacture products in batch operations. Each grade of product needs a specific additive. Keeping additives close to the point of addition minimizes wasted time. It also ensures the product quality remains consistent. This could require strategic placement of 55-gallon drums. Drums stored outdoors may accumulate rain water on their tops. As the temperature heats up and cools down between day and night, the pressure in the drums rises and falls. The pressure balances with the atmosphere by “breathing” through the drum openings, which do not seal 100 percent. This breathing process draws water into the drum, reducing the product quality. Drums may corrode due to exposure to the elements. They are also at risk of puncturing by moving machinery or mishandling. Leaks may even occur during dispensing. Product spills and leaks are harmful to the environment and place personnel at risk. Flammable materials may ignite, while other chemicals may be toxic to humans. Made of polyethylene, EcoPolyBlend™ Spill Control Pallets resist chemical attacks from hazardous acids, caustics and solvents. Use indoors or outdoors as large spill centers for collecting and dispensing fluids. They are available in 2-drum or 4-drum pallet sizes and have forklift pockets for ease of moving. Their built-in sump satisfies EPA requirements for secondary containment. These pallets also meet NFPA and IFC requirements. Weather-resistant polyethylene EcoPolyBlend DrumSheds™ feature convenient roll-top doors at the front and back to provide access for loading and unloading. Both doors accept padlocks for extra security. Easily move empty DrumSheds with forklift pockets. 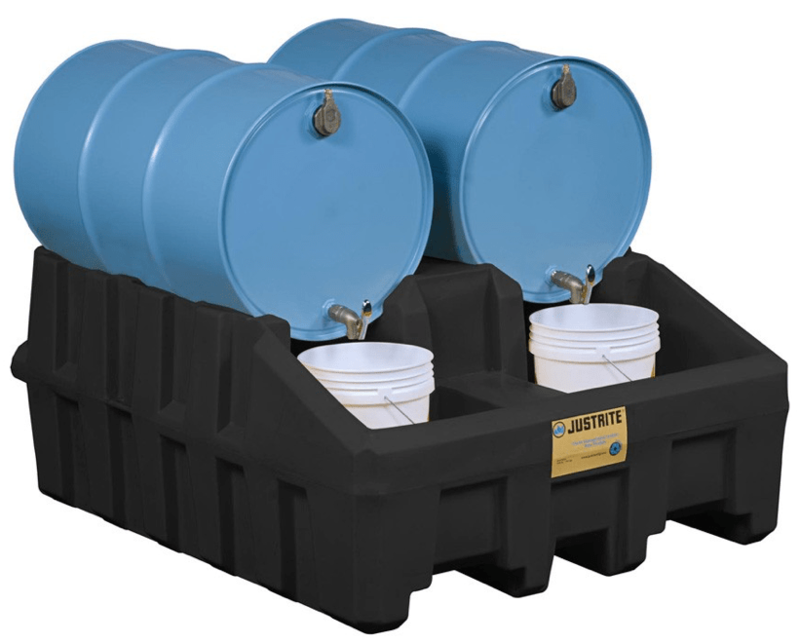 Built-in sumps with durable grating facilitate inspections and cleanup of any spill. EcoPolyBlend DrumSheds have enough headroom space to accommodate dispensing pumps and funnels. Safety features include grounding capability and integral anchor bolt locations for wind resistance. EcoPolyBlend Drum Management Systems help organize drums. 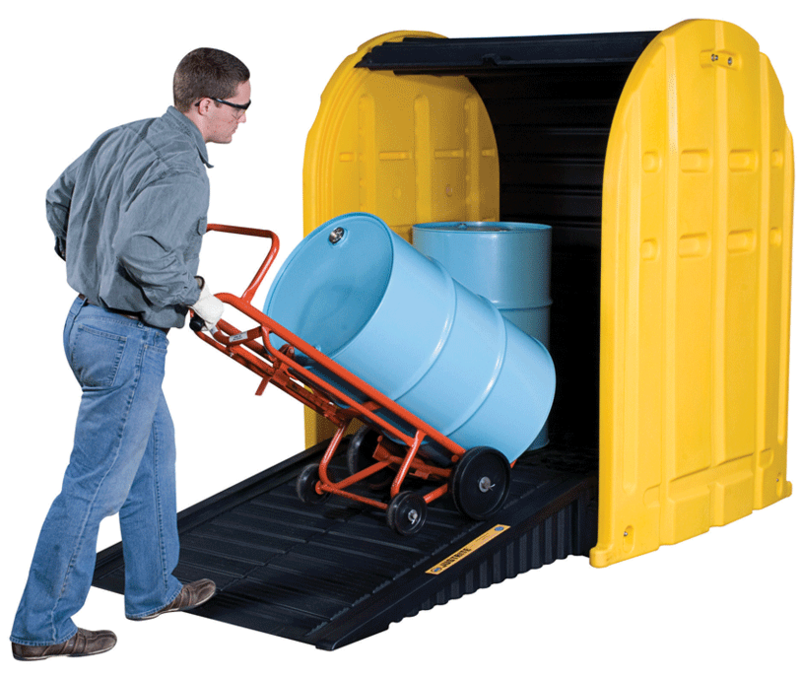 They accommodate horizontal storage of up to four 30- or 55-gallon drums. The Base Module holds two drums with a 3060-pound (1388-kilogram) load capacity. An optional Stack Module allows for another two drums on top. Molded drum lock channels and strapping hold drums in position. Open-view sumps make spills visible and easy to clean up. A separate Dispensing Shelf mounts to the stack module for convenient dispensing from the top level. 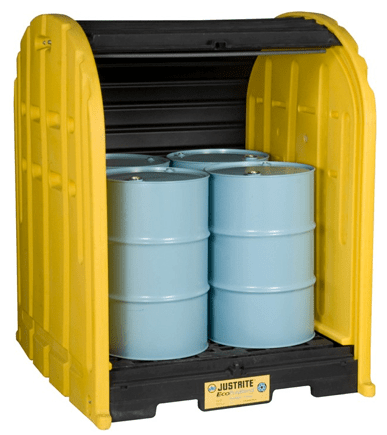 Storing 55-gallon drums outdoors helps make operations more efficient. But, there are risks. 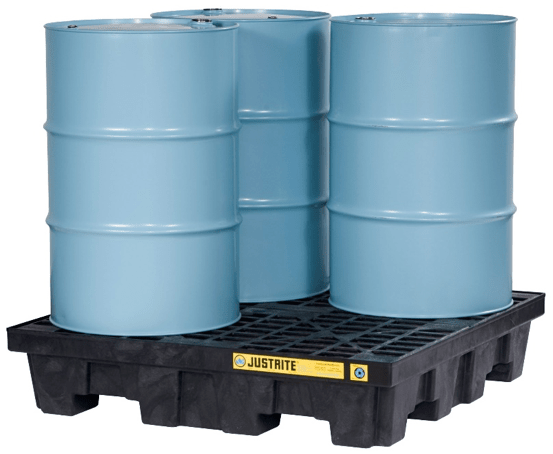 Mitigate these risks by using compliant and effective drum storage equipment from Justrite. We also offer drum funnels and equipment to prevent spill when transferring flammable liquids.